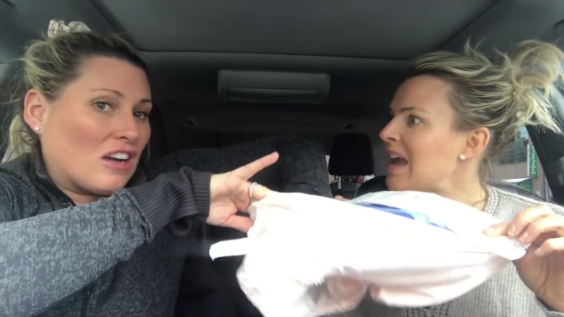 A hilarious video of a couple of mothers telling the truth about what happens after childbirth has gone viral. Best friends Catherine Belknap and Natalie Telfer, otherwise known as Cat & Nat, run a digital platform called Social Common. They aim to help fellow mothers with a healthy combination of humour and honesty. The Toronto mums recently shared a video on their Facebook page titled “What they DON’T tell you about childbirth”, and boy do they reveal a lot of home truths about the aftermath of giving birth. First and foremost, they warn any future mothers out there that nothing can prepare them for what’s to come. “Literally everything that you thought would be is not, and it’s actually more like the opposite,” they say. Unlike other portrayals of motherhood in the media that show new mothers absolutely glowing with perfection, Cat and Nat aren’t here to sugarcoat the truth. While bringing a baby into the world is a loving experience, it also involves investing in enormous underwear, bucketfuls of sanitary pads and an ice pack. “They recommend comfortable underwear. Bring out the big guns,” they advise. “Comfortable for me used to be a thing. I’m not going to lie, I’ve got a hungry bum and what’s comfortable is a thong. The video goes on to cover the importance of the ice pack, how to cure haemorrhoids and facing the prospect of stitches after childbirth. So far, their video has amassed 114,000 reactions on Facebook, has been shared 217,000 times and has been viewed 18 million times. Clearly, a lot of women out there could relate to Cat and Nat’s stellar advice. One woman wrote: “Yesssss! Preach! I was so disillusioned that no one had prepared me for the after.